Here at FoodStuffFinds we are big fans of the humble Pomegranate and have reviewed as many different takes on it as we could find. When the PomeGreat guys got in touch and asked if we'd like to try the new Light version of their range I jumped at the chance. And here it is! There is nice white packaging instead of the moody dark packaging that the lovely Pom & Blueberry variety comes in. Like that this is also from concentrate (boo) but has their PurePlus super concentrate in it which tends to give the flavour more of a kick which is nice. This contains Stevia (which is not to be confused with Miranda's best friend) a crushed leaf which has a similar taste effect to sugar but contains less calories. At least according to the science blurb anyway. Sugar has a strong initial sweetness, where as stevia has a sweetness at the end of the taste (but none of the aftertaste of non natural sweeteners) so there is a difference. This is noticeable when taking the first swig, it's a bit more watery and less immediate than sugar drinks. 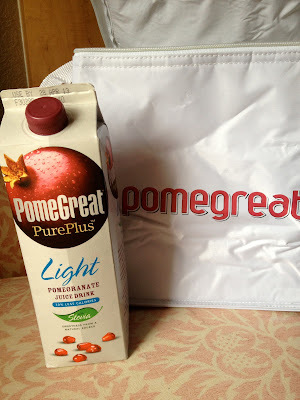 The strength of the pomegranate taste is at the end where it is usually the most powerful flavour there. With the Stevia in tow this is actually negated a bit, which is a bit disappointing for fans of the stronger drink, but great for people who enjoy things that taste like sweet pomegranate. This all said by the end of the pint (the 1 litre container doesn't have a serving suggestion so 2 pint glasses full it is!) you are just drinking a nice pomegranate juice drink and the alternate sweetness or composition doesn't really come into it. Perfect for summer days and refreshing drinks, especially if you want to have less calories in your food.